In Ethics Lab's flagship courses, students tackle some of our society's most pressing ethical issues in a format that combines deep theory with active, team-based projects. Traditional lectures, guest speakers, and readings are supplemented with inventive exercises designed to integrate reflection and character development. The aim of flagship courses is to help students grow in their understanding of ethics and human value, and to wrestle with critical, real-world issues to help develop them as moral citizens and leaders. How does social media impact the way we engage with our democracy? The internet has radically changed the way people develop world views and engage in political conversation—in ways both good and bad. Social media has expanded opportunities for political voice to people who previously lacked it. But the effects of targeted newsfeeds and self-selection have created information bubbles and echo chambers that have vastly increased polarization and suspicion of those with different views. Is divided democracy inevitable or are there means for maintaining a robust republic in the digital age? How do we assess what counts as truth and expertise? What makes something propaganda rather than an unpopular opinion? Using current examples from the U.S. and global political conversations, this course examines questions of truth and democratic ideals in the age of social media. What are the promises and perils of big data? This course explores the rapidly changing landscape of data ethics. Big data is revolutionizing practices in commerce, education, policing, national security, and medicine. Rapid advances in machine learning and artificial intelligence ensure that the pace and scope of change will only accelerate, even as ethical and legal frameworks lag far behind. Developing adequate ethical frameworks involves tackling difficult questions. How can big data be used for the public good? Does the use of predictive analytics in employment and policing decisions reduce or reinforce bias? Is privacy dead—and should we care? What does truth mean in the age of information bubbles? This course examines climate change from the perspective of global justice. We will consider questions such as: How do global inequalities impact the way people are affected by climate change? How does this bear on the distribution of responsibility for addressing climate change? How does climate change connect to larger issues of global justice? The digital world is increasingly changing the ways we interact with each other as citizens, friends, and consumers. This course investigates the ethical issues that emerge in our digital lives and seeks to give students tools for thinking through complex moral problems they may face as business leaders. We will analyze core values of privacy, consent, fairness, and legitimacy through case studies drawn from recent moral problems faced by the business giants of big data: Facebook, Google, and Uber. The goal of this course is to help prepare students to recognize, analyze, and grapple with ethical issues in the digital world. This course is offered through the McDonough School of Business and will be run through Ethics Lab. We will use creative exercises drawn from the world of design to tackle complex moral problems. 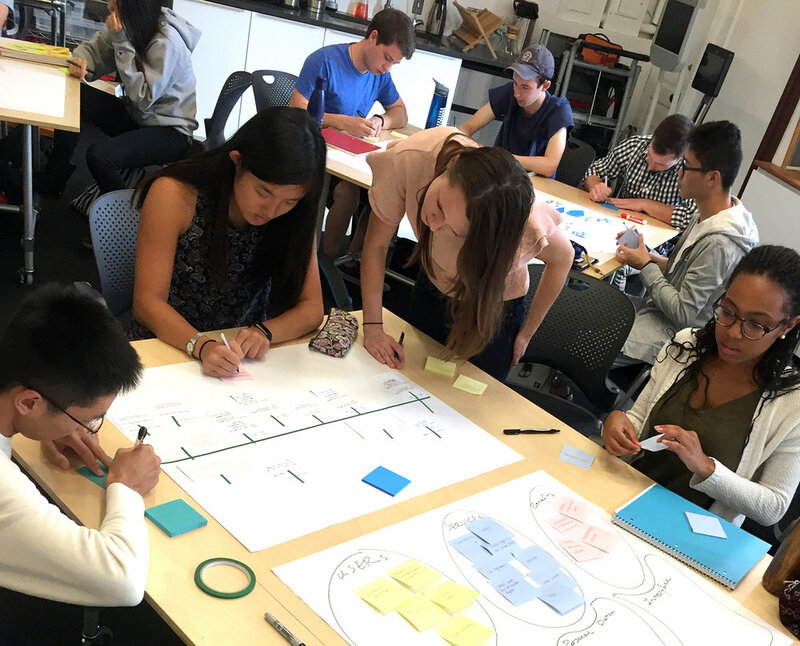 In addition to traditional reading and writing assignments, students will use tools such as empathy mapping, persona building, and engaged ethics design sprints to help them learn to identify and analyze complex moral problems in new ways. The final project will tackle a complex moral problem facing businesses in the digital age and will be built in stages of design sprints throughout the intensive course, to be presented in the final session of the ILE.